After over 12 years aboard MV DESERT VENTURE, it’s time to give new cruisers a chance to live the dream. 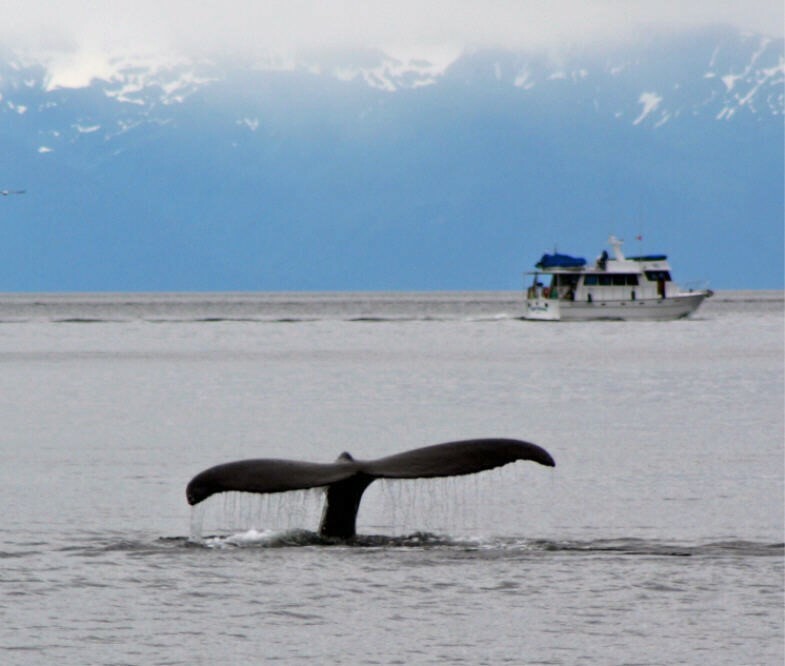 We loved our time aboard and it was no small decision to move ashore. 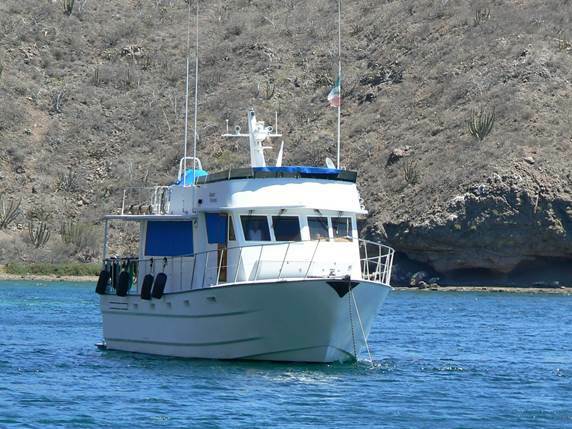 DESERT VENTURE (D/V) is a custom-built, all aluminum motor vessel. She is 54′ loa, 16’9″ beam, and has a 5′ draft. D/V has twin 5.9 Cummins 300 hp turbo charged diesel engines on V-drives. She has a 20 kw generator and a robust inverter system. We travel at an average speed of 7.8 knots. Regardless of where we are – at the dock, at anchor, or underway – we enjoy quality of life aboard. 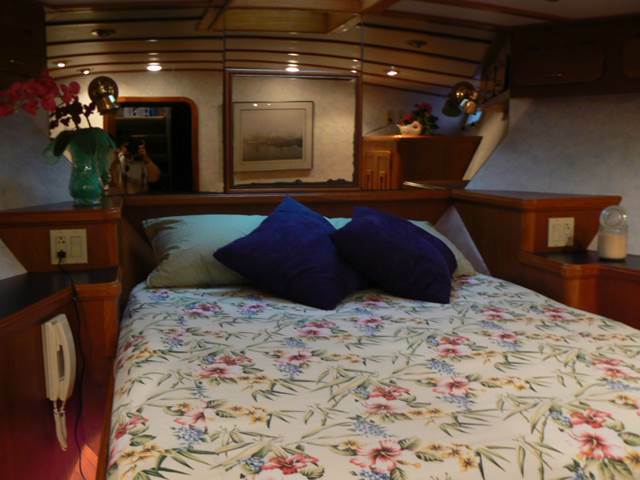 This blog tells the story of DV and how well she cruises, and was maintained by her Captain. It tells how much we love her and are proud of her seagoing abilities. DV took us up and down the west coast of North America – between Alaska and Mexico – four round trips. We went to Mexico twice, British Columbia numerous years, and to SE Alaska once. We spent extended periods of time at anchor, and in countless ports between Mexico and SE Alaska. We voyaged over 25,000 miles at an average of 7.8 knots. She is a steady boat that got us wherever we wanted to go safely and comfortably – never missing a beat. DV’s design is highlighted in the book, “Voyaging Under Power”. 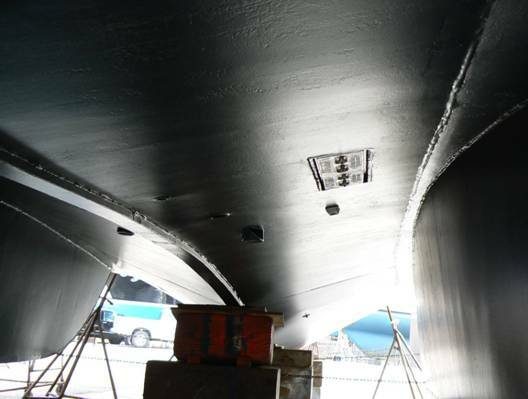 Underbody – center-line – looking from aft to forward, between twin keels – passive stabilization. 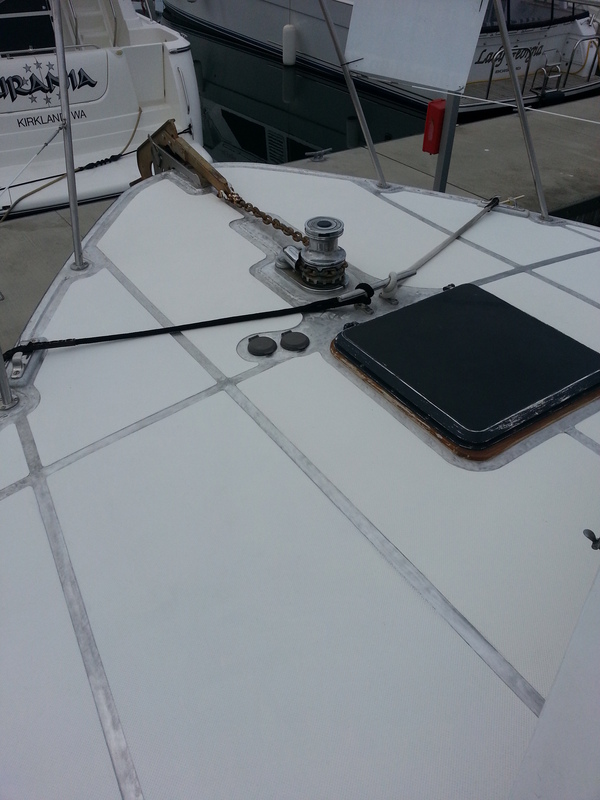 Starboard keel, prop and rudder . Props were tuned in the last boatyard. Pretty prop! Look at how protected the prop and rudder are by the keel. 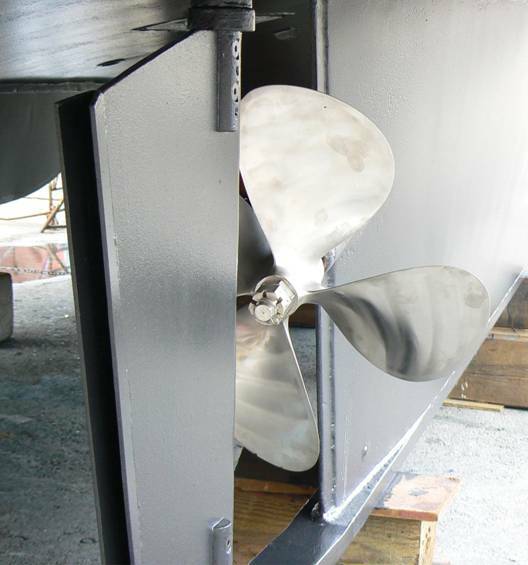 Did I mention the bowthruster? 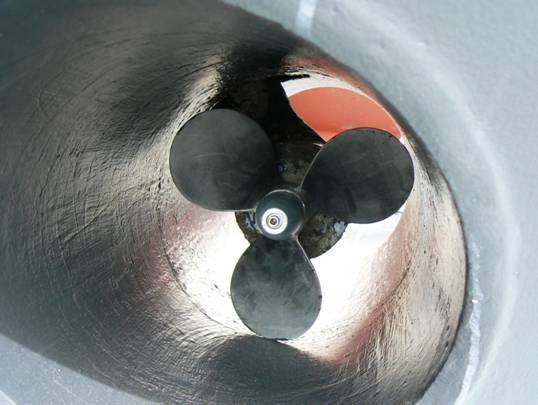 Zinc on Bow Thruster. The thruster is a valuable assistant at maneuvering time. She has a functional sea-going exterior design, and a luxury yacht interior. Built in Washington, USA, no expense was spared in her design, build, and livability. We believe that DV is the most liveable boat in her size. Desert Venture has walk around decks. When we were shopping for a boat, this feature was not one of our “must haves”. We didn’t know how valuable they are – for convenience and safety. It will be a “must have” on any future boat. There is debate that walk around decks reduce the interior living space. You won’t notice it on DV. And, we think it is worth it. The decks are walk around and open, with a sturdy stainless railing. This means what water may come on to the decks runs off. The railing is high and makes boating safer. The open deck, forward, allows full view of the water – far off and directly ahead of the boat. It is a wonderful feature. 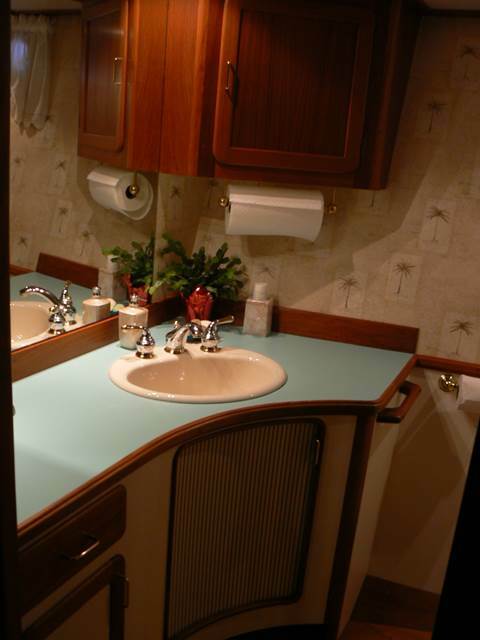 There is a sink and refer on the aft deck. 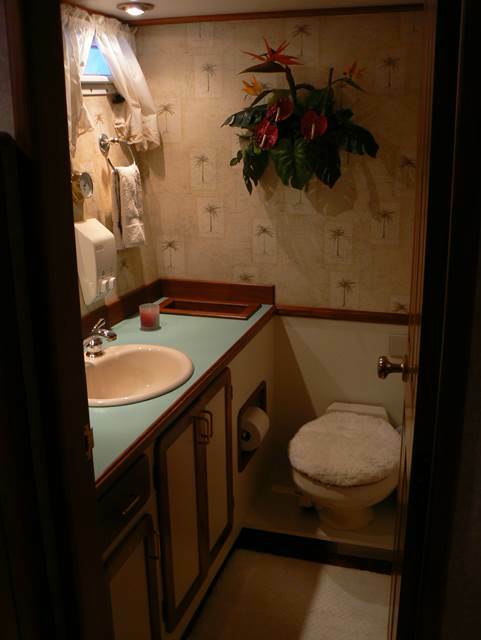 Again, it never occurred to us, but that sink is a life saver for the First Mate. All nasty cleanup jobs are done outside, rather than in the galley. Catch fish or crab? No problem! It’s all cleaned on the aft deck. 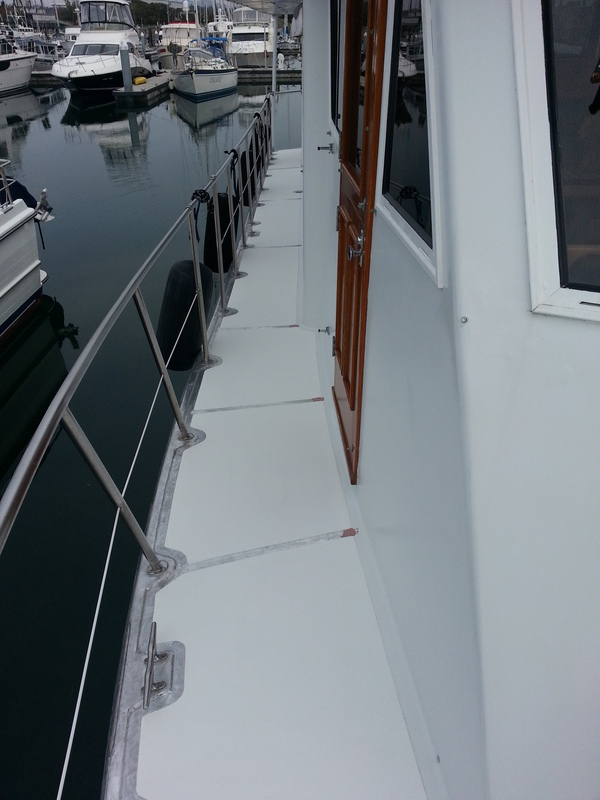 The boarding steps – on the port side of the transom make getting on and off the boat simple and safe. There is access to the steps, across the swim platform from both port and starboard. The aft deck is covered. We use it in all weather. 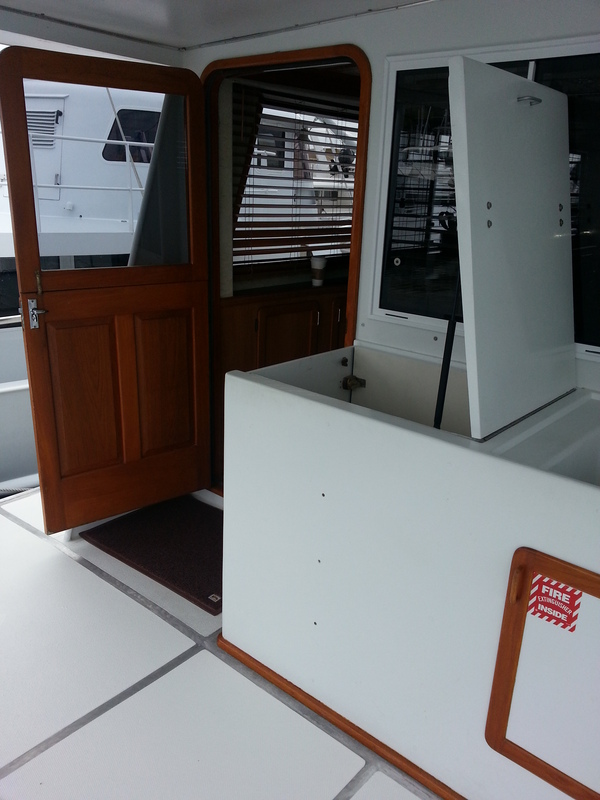 The engine room access is on the aft deck. 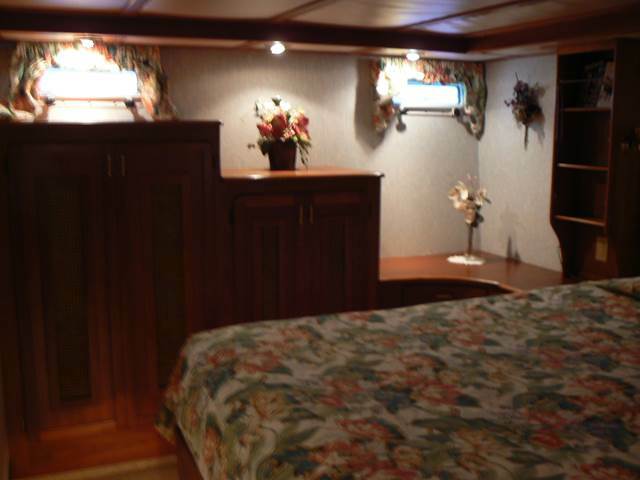 The flybridge has a built-in settee.There is a complete helm station on the flybridge. We often set up chase lounge chairs and soaked up the sun. The main level floor plan has a pilot house, with access to the fly bridge. 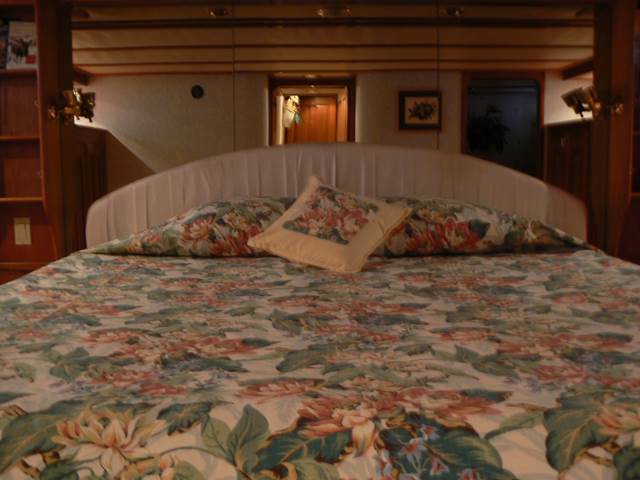 The pilot house provided great living space while underway, at anchor, or tied to the dock. There is great visibility of the seas from the settee. The galley is aft of the pilot house. The galley has modern appliances – LG Refrigerator, GE Profile Convection/Microwave Oven, GE Profile propane cook top, and garbage disposal. Storage abounds. 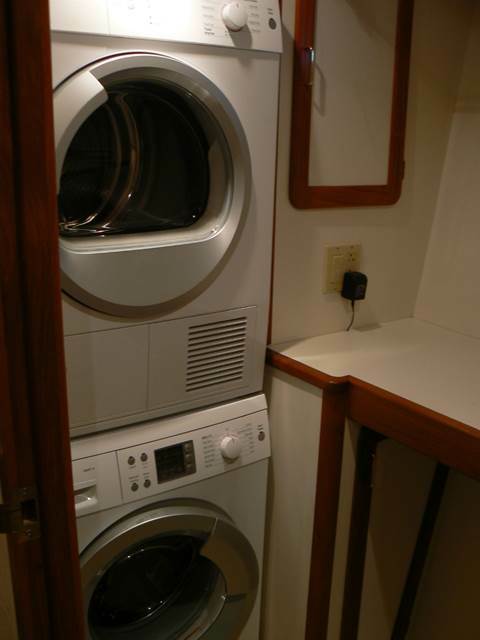 There are cupboards all along the port side of the boat opposite the galley and salon area. There is a food pantry on the lower level. 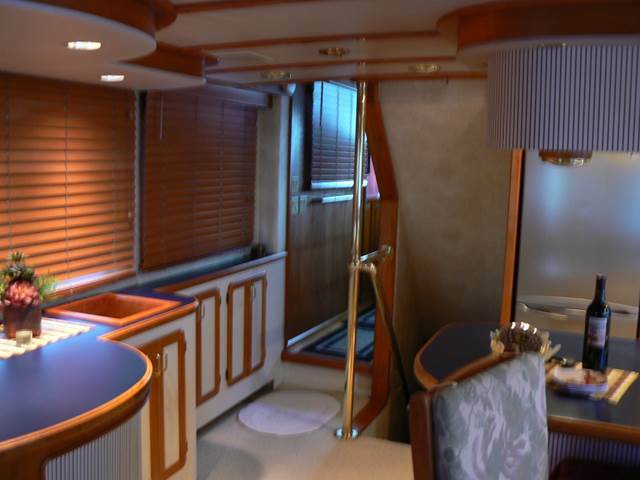 The main level has faux wood blinds that are very efficient in keeping the cold and heat out, and preserving privacy. DV has a full set of exterior sun protection screens. The salon is roomy and lends itself to comfortable full size furniture. The salon/dining area has a bar top, but is roomy enough for table and chairs. Access to the living space below, is via a house style stairway – making it a safe passage. Forward, is the VIP Stateroom with walk around queen bunk. A Guest Head is aft of the VIP to starboard. The head is roomy, including a shower and vacuflush head. Storage abounds. Opposite the Guest Head, is the Utility room with Bosch Stacking washer and dryer. Energy efficient – power and water-wise. A wonderful benefit aboard. Opposite the washer and dryer, in the utility room, is a combination freezer/reefer for extra refrigeration. Moving aft, to starboard is the Crew Stateroom. 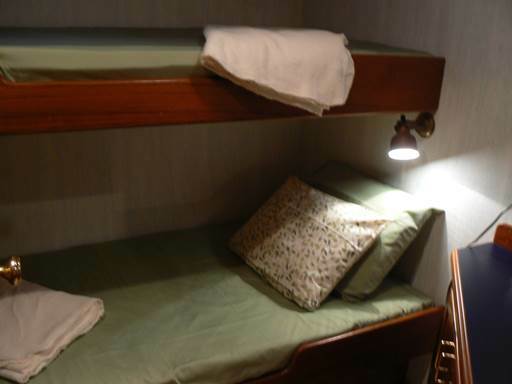 Twin extra-long bunks, two drawers of storage under the bunks, a locker storage with counter top, and a hanging locker with bookshelf above makes up the crew stateroom. Aft of the crew stateroom is the Master Stateroom. Starboard and Port sides have identical storage. King size walk around Select Comfort mattress bed. The Master Stateroom has its own private head with shower. The interior is stunning in the craftsmanship and design. Beautiful, comfortable, plentiful, efficient, and clean. As valuable as the living amenities are – DV isn’t a proper yacht unless the same can be said about all her mechanical systems. There isn’t a boat owner out there who will argue that a standup engine room is priceless. All mechanical equipment is accessed via the engine room. No lifting the salon decks to get access to engines or other equipment. DV has a beautiful, clean, and roomy engine room. 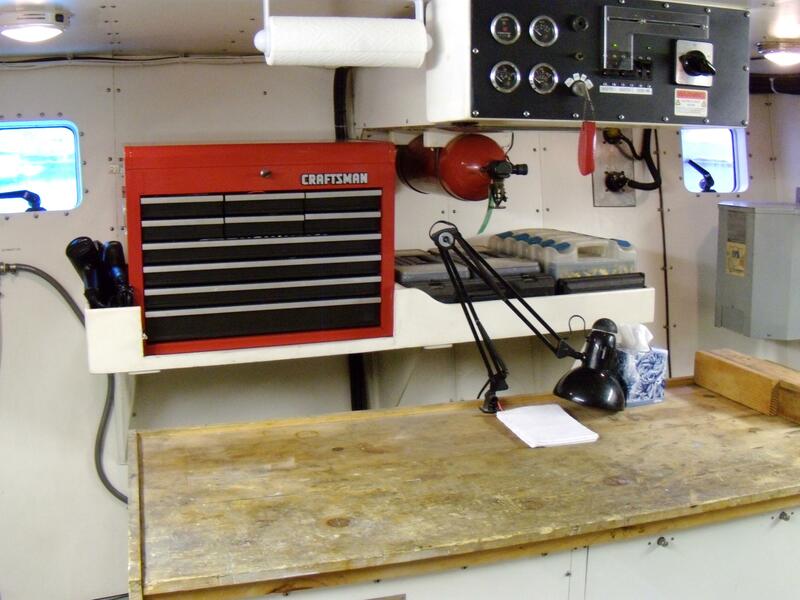 The photo above is a workbench on the 20kw generator. As you can see, the workbench gets used a lot. It’s difficult to stand back, even in a roomy engine room like that and give you the full view. The main engines are outboard on port and starboard sides. Above is the starboard main engine. 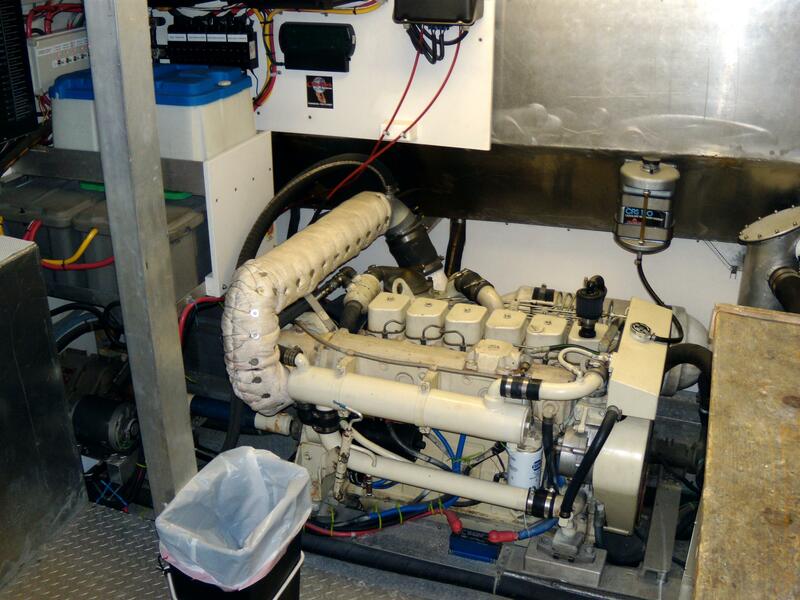 All maintenance done on the boat – including the main engines is included in the maintenance log. Great detail in the log tells when, what, why, how, and with exactly what pieces, parts, model and part numbers, sizes, and lubricants, etc. were used. There will never be a question about what was done to maintain DV. It’s in the log! Change the main engine oil? It’s in there. Change a light bulb – number of watts, etc – it’s in there. Need a screw for the thinga-ma-gidget – it’s in there! The amenities of DV go on forever – at least to us, who saw the value provided in quality of life. I’ve talked about quality of life aboard underway, at anchor, or at the dock in many blog posts. Of course we didn’t abuse our power privileges, but there are many things you can do underway or at anchor – without the generator running. Watch a movie, pop popcorn in the microwave, run your computer, blow dry hair, make coffee, toast, turn the lights on – many options available. Note! Just don’t try them all at once! There are limits – of course, and it’s important to manage your resources properly. It’s not hard to tell that we truly love DV and all she offers. Though it grieves us to say goodbye to her, we are excited and hopeful that an adventurous couple will come along and keep “The Dream” going, by taking DV and making more memories. Meanwhile, DESERT VENTURE gets prettier every day as we continue her exterior cosmetic improvements. The work is almost done! We tell her that new friends are coming soon! She can’t Wait for new Cruisers! At this writing DESERT VENTURE will be at Cap Sante Marina during Trawlerfest, May 15-17, 2014, in Anacortes, WA. Make plans to stop by and check her out! 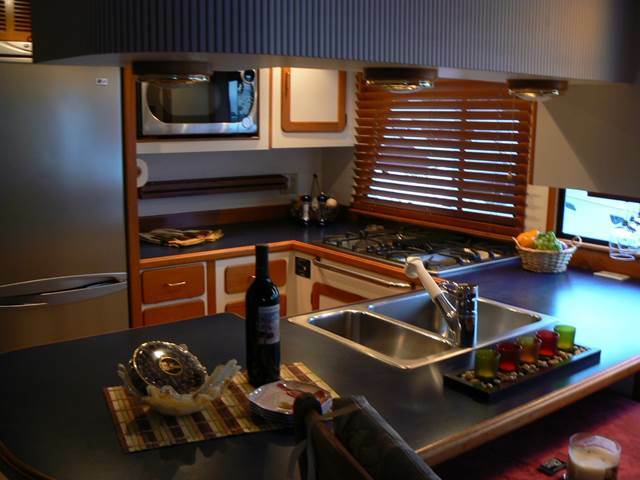 This entry was posted in 2013, Cruising, Pilot House Motor Yachts and tagged Baby Boomer Lifestyle, Boating, Coastal Cruising, Cruising, Live Aboard Boats, Live Aboard Lifestyle, M/V DESERT VENTURE, Pilot House Motor Yachts by Angela. Bookmark the permalink. If it is heart wrenching for us to see the immaculate and beautiful Desert Venture pass on to other owners, we can imagine your ambivalence! Thank God your new home is gorgeous and in a peaceful and breathtaking location! Thank you for for sharing your adventures and lives on board so generously! Good luck and God bless you in this next phase of your lives! Wow, hard to believe you are giving up the sea life, but also understand. It has been great reading and living the sea life through you and Bruce during your adventures and blogs. Please let me know where you two are going to call home and even an email address and other contact info as you get settled. Definitely want to keep in touch with you and Bruce. Take care and enjoy the much deserved stable platform called land. Wow, what an ad VENTURE she has provided for you and a beautiful vessel she is. I know it was a tough decision for you.